It’s Springtime & the Farmer’s Market is open! Granted, there was frost on the ground yesterday morning… but then, I do live in Idaho so I’m not surprised. We’ve been to the park every day this week, we bought seedlings & planted them today, the sun is out, and I think I have a little sunburn (oops!). 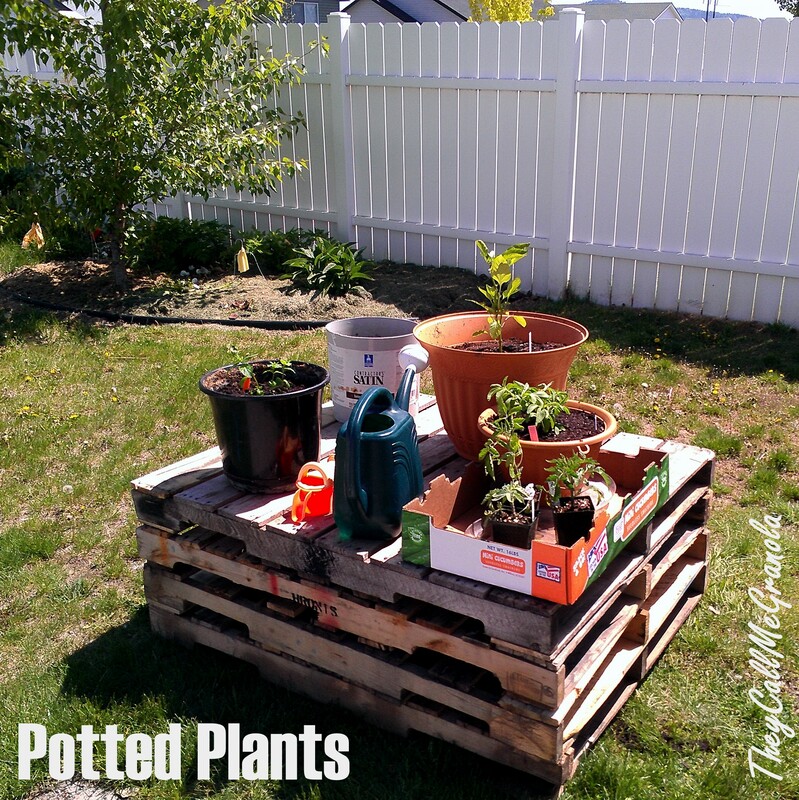 So, since it’s spring & I’m so happy to be outside planting & otherwise playing in the dirt with the kids, I thought, during naptime, I’d take you on a little garden tour… I never knew how much I had growing until I did these pictures! I’d feel like superwoman if I didn’t know that most of it just comes back on it’s own every year! 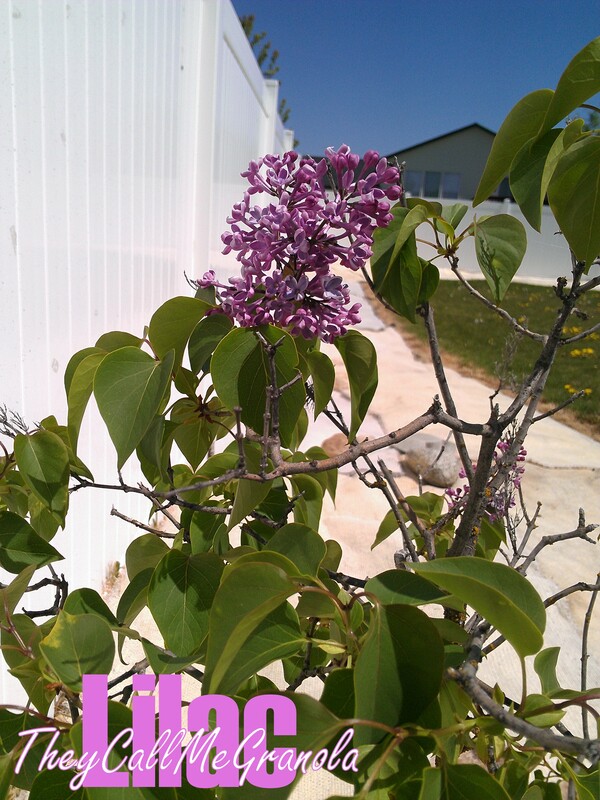 Oh how I adore Lilacs! There isn’t a better smell in the whole world. I remember it used to waft into my bedroom window in the springtime when I was a kid… I could have sat there just breathing all day! I can’t wait till my little plant grows into a tree! Next to the Lilac is my newly planted Garlic! Got this at the Farmer’s Market this morning. 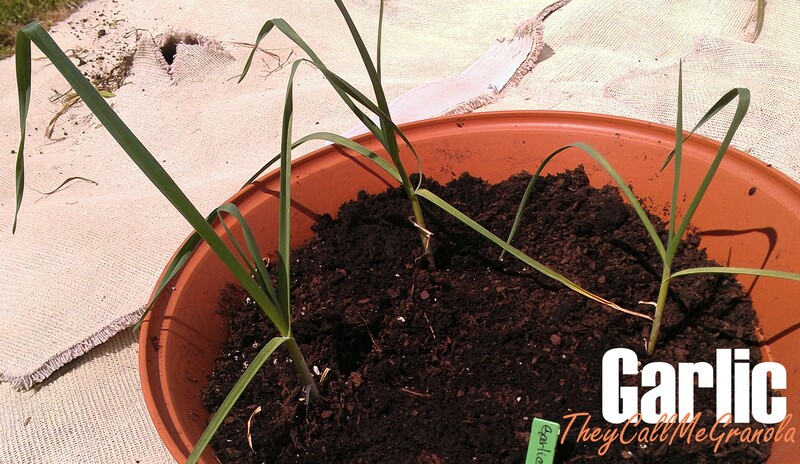 I’ve never grown garlic before, so we’ll just wait & see what happens. I do have old used carpet spread in my garden beds because they were just converted last year from lawn into garden… we’re hoping to kill off all that grass! Behind the pot of garlic is a hole I cut in the carpet where I will plant the tomatoes when it’s warm enough at night. Here’s all my newly potted plants. The flat of starts I’ll still have to bring in at night, but everything else should be okay outside. 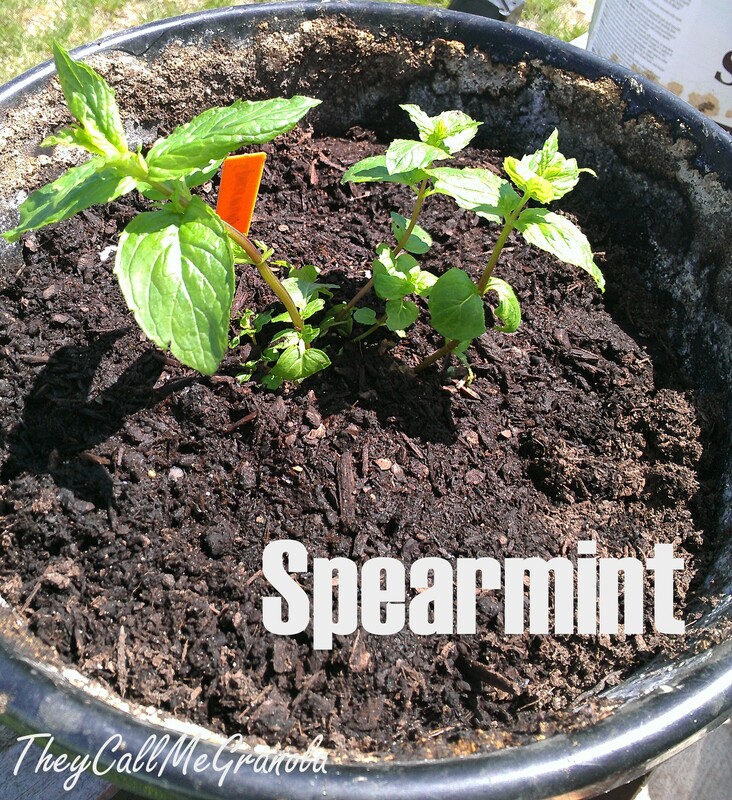 One of the pots is Spearmint! 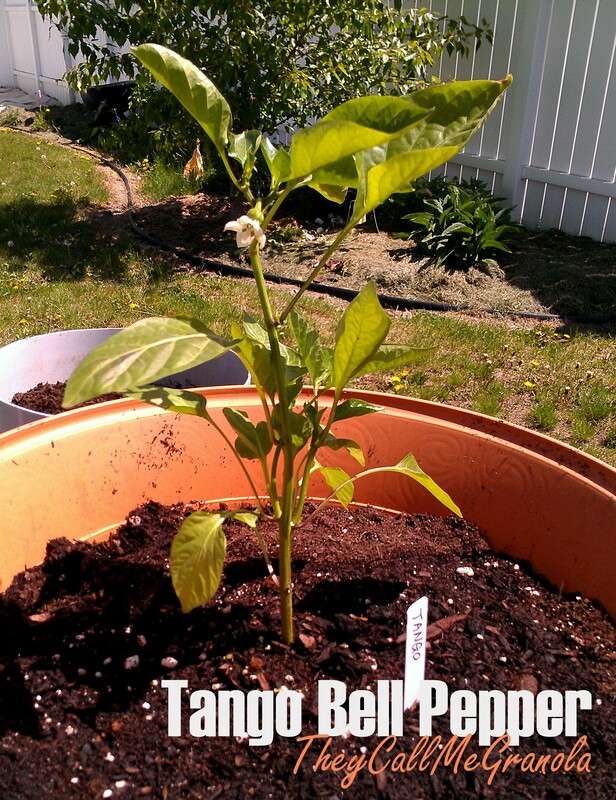 Yumm… my kids will looooove that we planted this. One of their favorite pastimes is running through the herb sections plucking little snacks for themselves! Being that they are only toddlers, I devised a marking system so they know which plants are edible. You’ll see little hokey “flags” around my garden next to the edibles. Oh those kids… Bought this just for them too! If I serve peppers with lunch (raw mind you), they’ll each eat a whole one & then ask for more! This one already has a bloom! 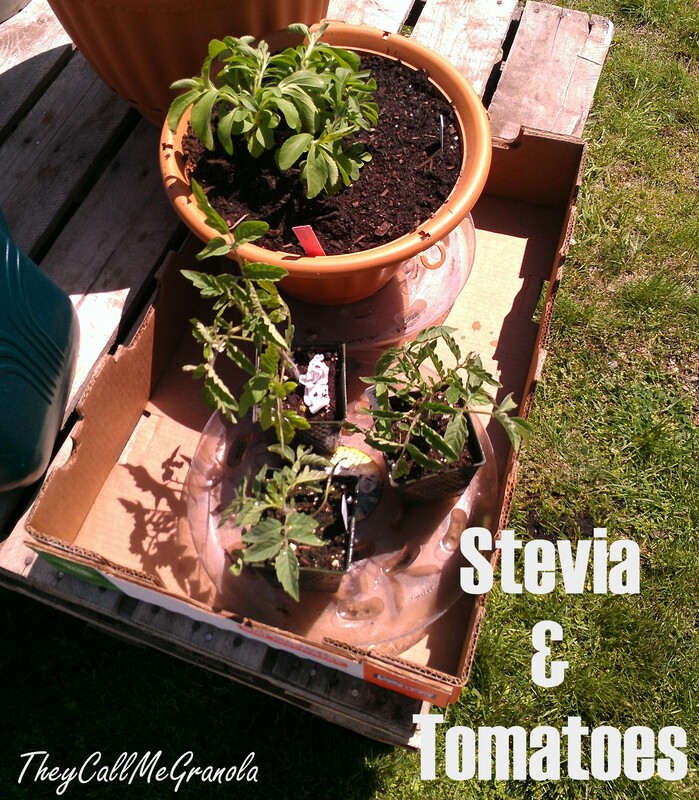 Here’s my Tomatoes & Stevia. I have some Cherry Tomatoes, a Black Krim & a Rose Tomato. I’m hoping all of them do great. Again, for those kids who will eat more tomatoes than anyone else I know. I’m excited about the Stevia too. I hear it’s easy to grow & comes back each year. I’ve been switching the family to more natural sweeteners lately & I just don’t really like the liquid Stevia or the powdered kind. I’m hoping that brewing a couple Stevia leaves with my loose-leaf teas will sweeten them just enough. The last of my potted plants is this Basil which I still have to keep inside. I have a wonderfully sunny kitchen window that I’m hoping he’ll love! 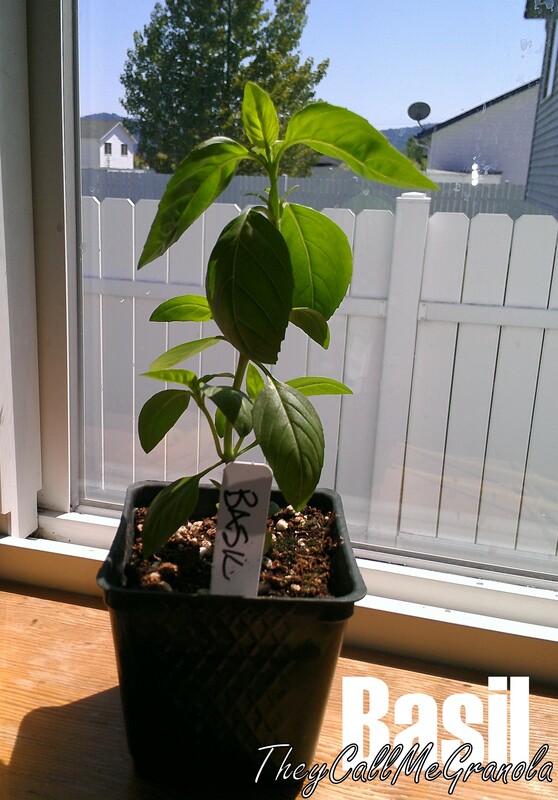 Can’t wait for fresh Basil. 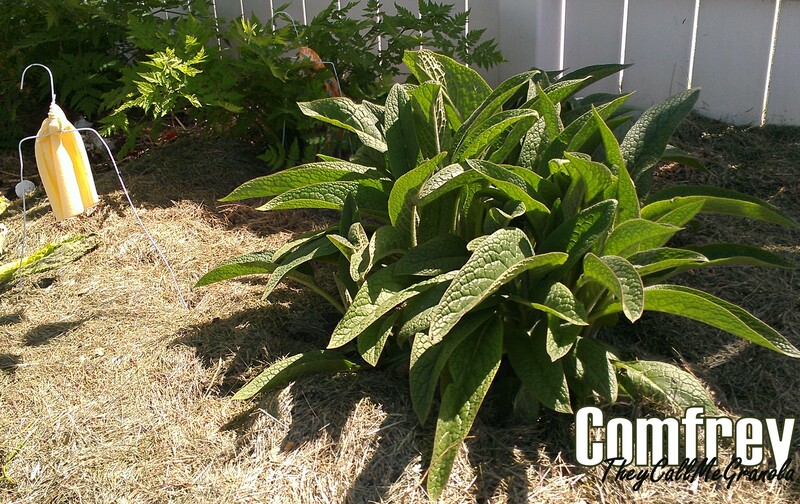 Continuing our tour, the backyard planter is home to my ever expanding Comfrey plant. This plant has already been so valuable to us. We dug up a root from my mom-in-laws a few years ago & planted it. I made a salve with the leaves when my son, who was born with eczema, started getting worse & worse. We’d slather him up every day after a bath long enough to wrinkle him & he was eczema free in a month… and has been ever since. I also used a comfrey poultice when I was threatening mastitis for the umpteenth time. It’s good for sprains, bruises, aches & pains. Love this plant & it just grows & grows! The yellow “flag” you see to the left in this picture is a special marker for my 3-year-old who’s job it is to take out the compost bucket in the morning. I have yellow, red, pink & blue flags in different spots in one of the garden beds. I just tell her which color flag I want the bucket emptied by & she’ll take it there. The orange “flag” behind the comfrey is marking a plant that I know is edible but I forget the name! Haha! I’ll introduce him shortly! 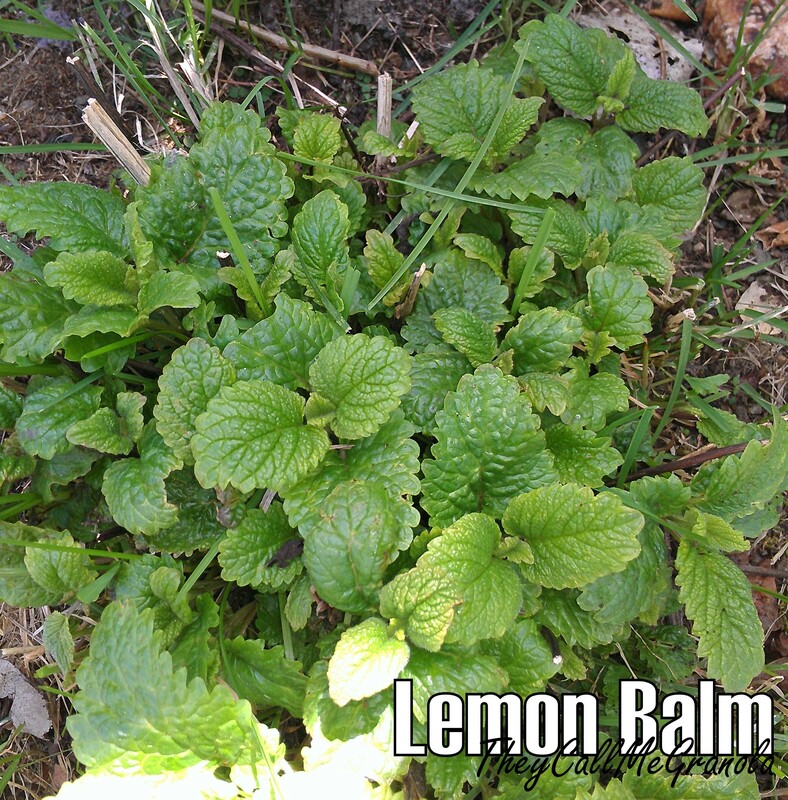 Here’s my Lemon Balm. 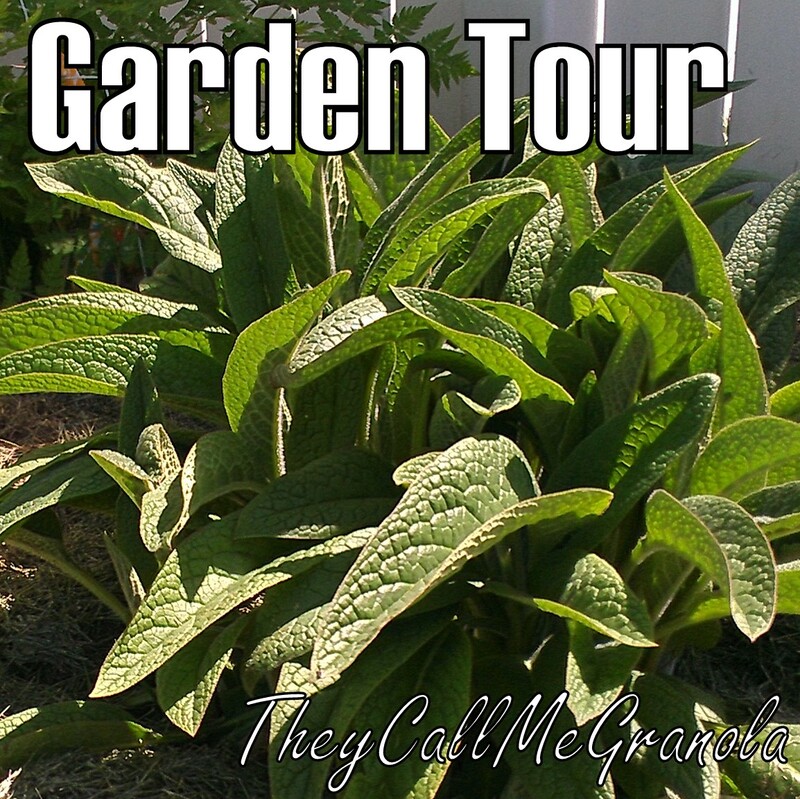 It’s part of the mint family & is great in iced or hot teas. It also has medicinal properties such as calming indigestion, promoting sleep, and even treating cold sores. What a wonderful addition to my little herb garden. He’s little now, but if I remember correctly he was about 1.5 feet tall last year. And here’s that plant I’m not sure what it’s called. It tastes like licorice but it’s not anise. It looks like a fern. It’s edible. Help? Anyone know what I’m called!? 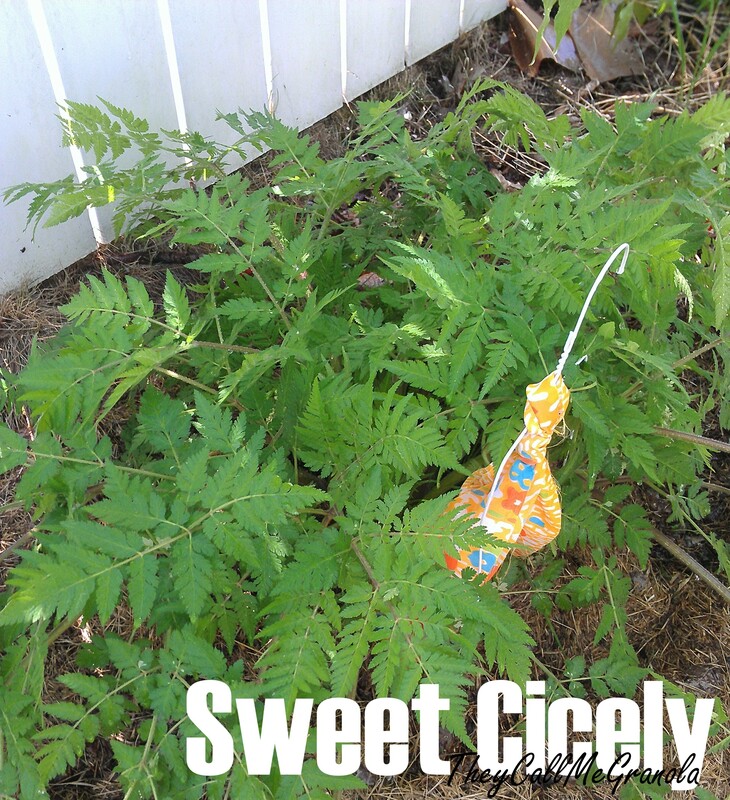 EDIT: It’s called “Sweet Cicely“! It’s related to Anise & Fennel but not the same. 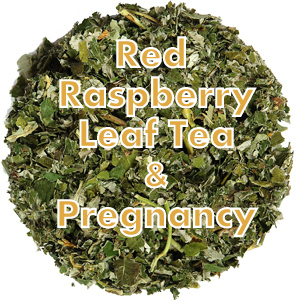 I’ll likely be utilizing many of this herbs useful properties in the near future… natural sweetener, expectorant, & also as an aid to menstrual pains! I love the idea of pairing it with all that rhubarb I have growing! Oh boy… my kitchen garden! This herbal kitchen garden surrounds a tree in the front yard. 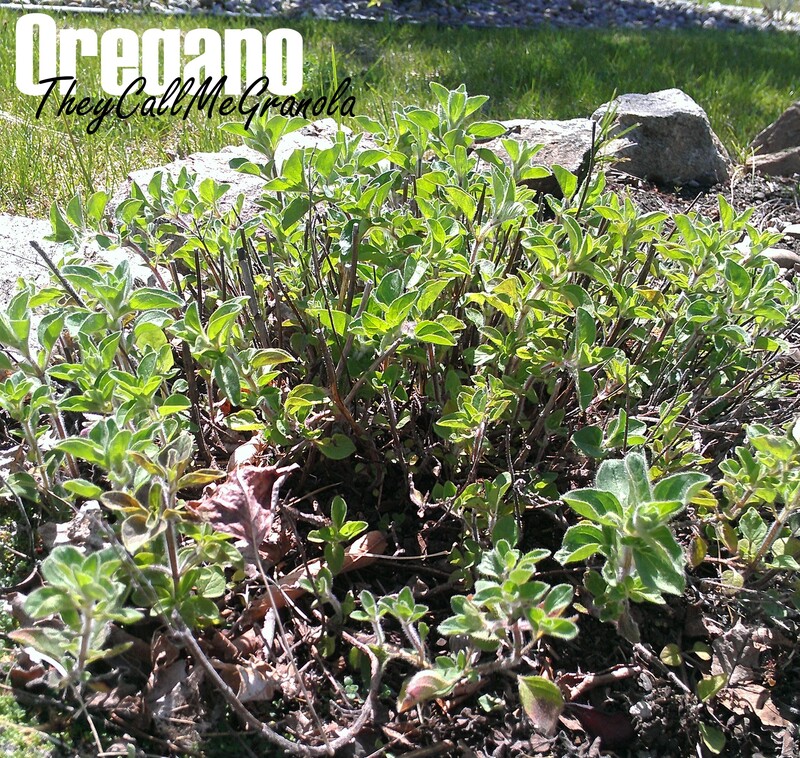 We have Oregano… another of the plants the kids love to munch! 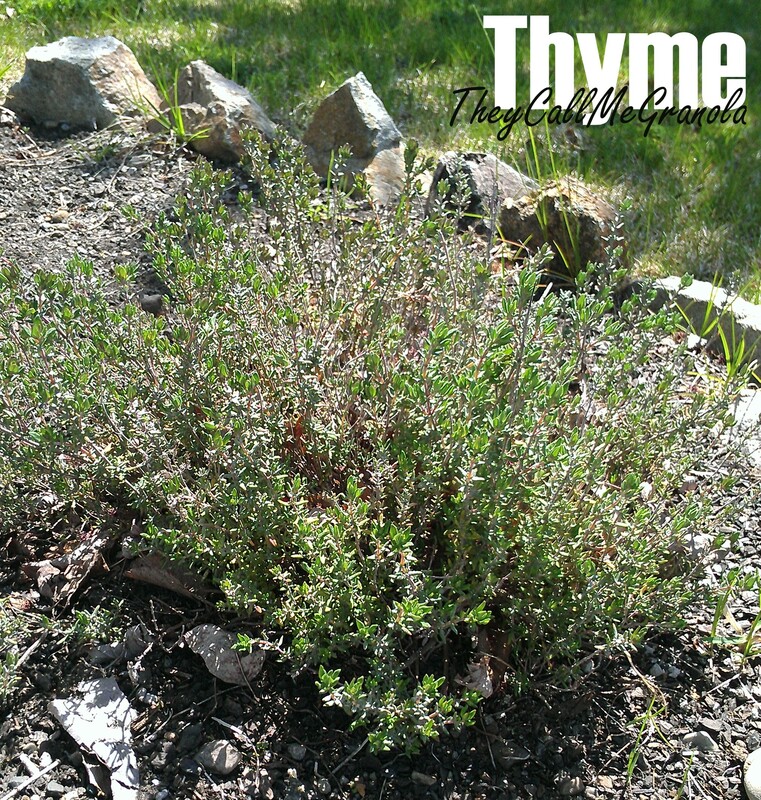 And a Bush Thyme just pushing through it’s blanket of leaves from the winter. I’ve had to keep a close eye on the kids this year so we can let these little plants get a good start! I do love when my kids smell like oregano though! It’s so cute. Last but not least in the kitchen garden… this is my front flower bed. We ripped out these ugly old bushes right when we moved in. Trimming bushes… now there’s a total time waster. So, I have Irises because they’re pretty and easy! 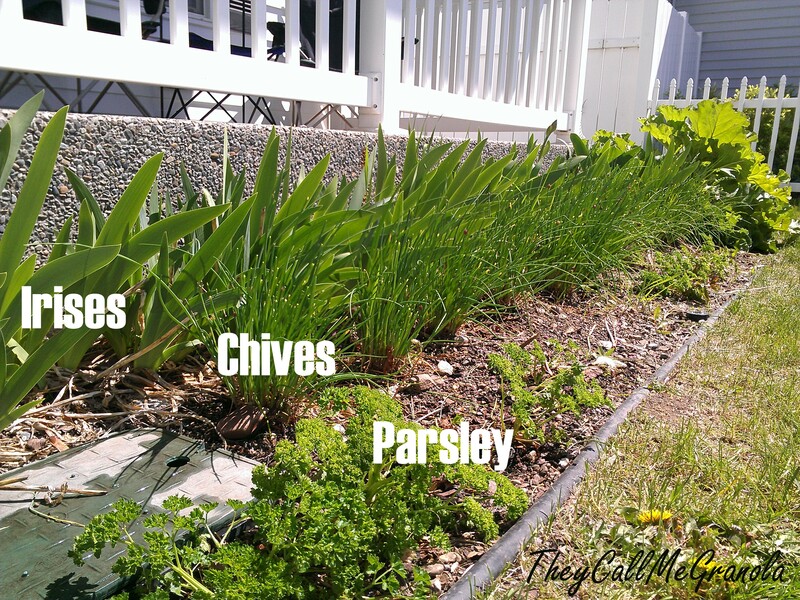 Then there’s my enormous amount of Chives & Parsley… well, there’d be a lot more Parsley if the kids hadn’t mowed it down so quickly… it’ll come back! I love having tons of these herbs for using fresh or in cooking. And they make some beautiful edible landscaping as well. In that same planter with the Chives & Parsley is my Rhubarb! Oh yumm! Don’t you just love Rhubarb with a delicious buttery brown sugar crisp topping! Oh it’s wonderful! 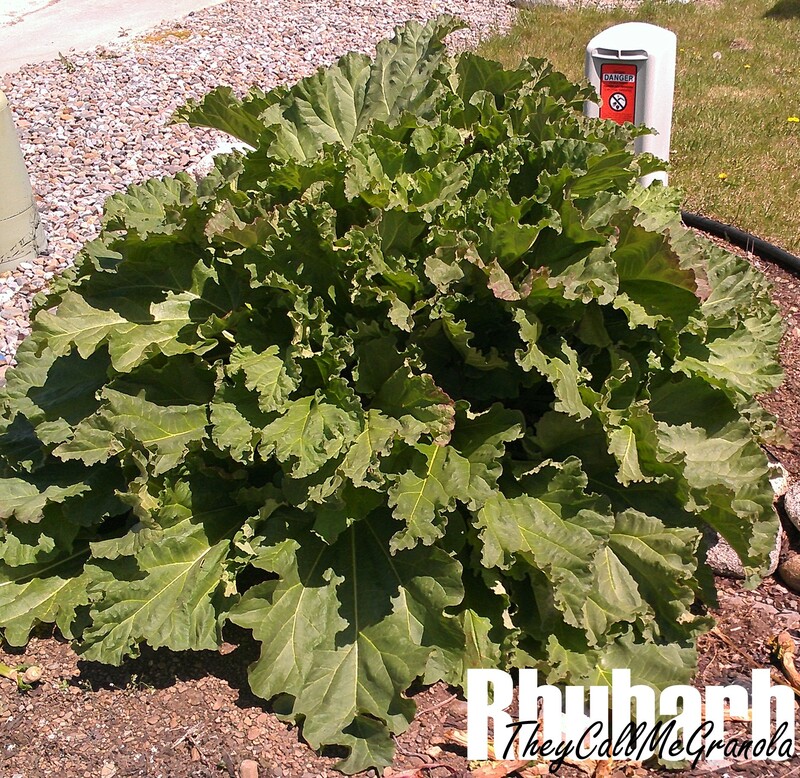 I have another Rhubarb as well down by the sidewalk… he’s even bigger! See… when this dude decides it’s time to grow, he practically leaps out of the dirt. 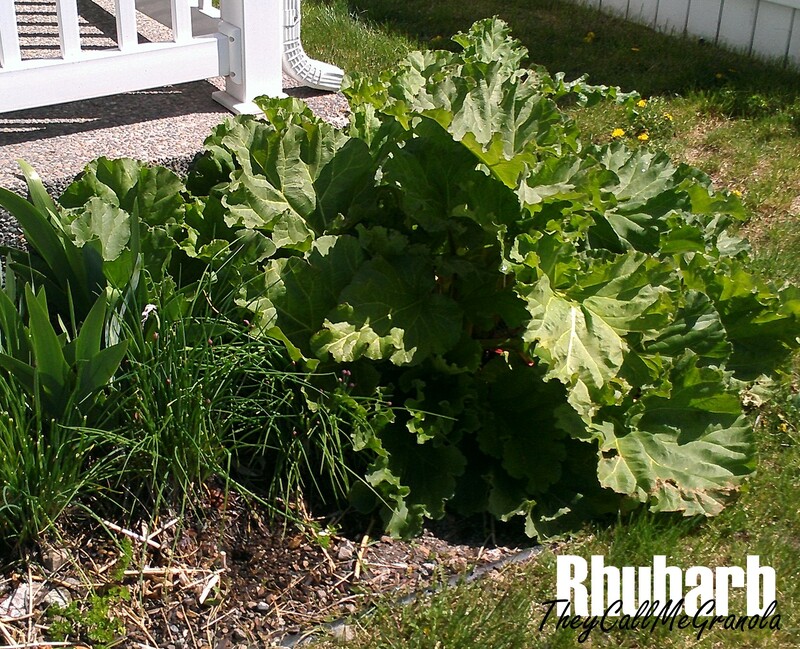 One day I’ll say, “Oh look, the Rhubarb’s coming up.” The next day it’s up to my hip! I’ll get waaaaaayyy more Rhubarb than I can use this year. And here is perhaps the ugliest of my garden spots on this Garden Tour! And it’s another of the front planters too! My apologies to the neighbors. 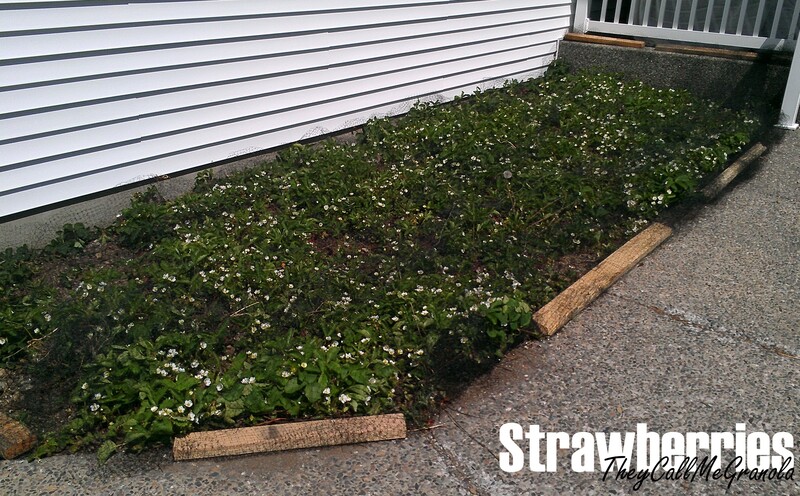 Last year the starlings got to the whole strawberry patch and we didn’t get a single berry. It was so disappointing. This year we covered it with bird netting… please let it work! 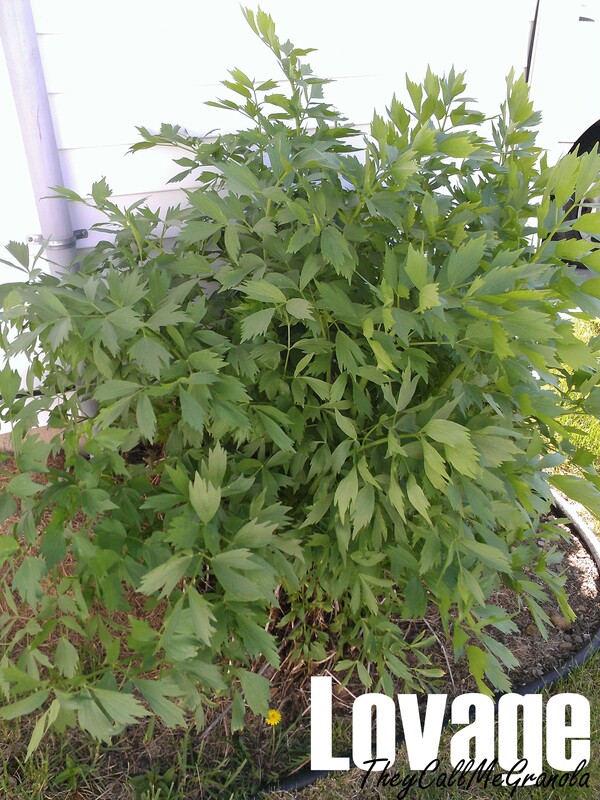 UPDATE: This is a Lovage plant… It’s HUGE!! I have two of these as well & they come back every year bigger than the last. 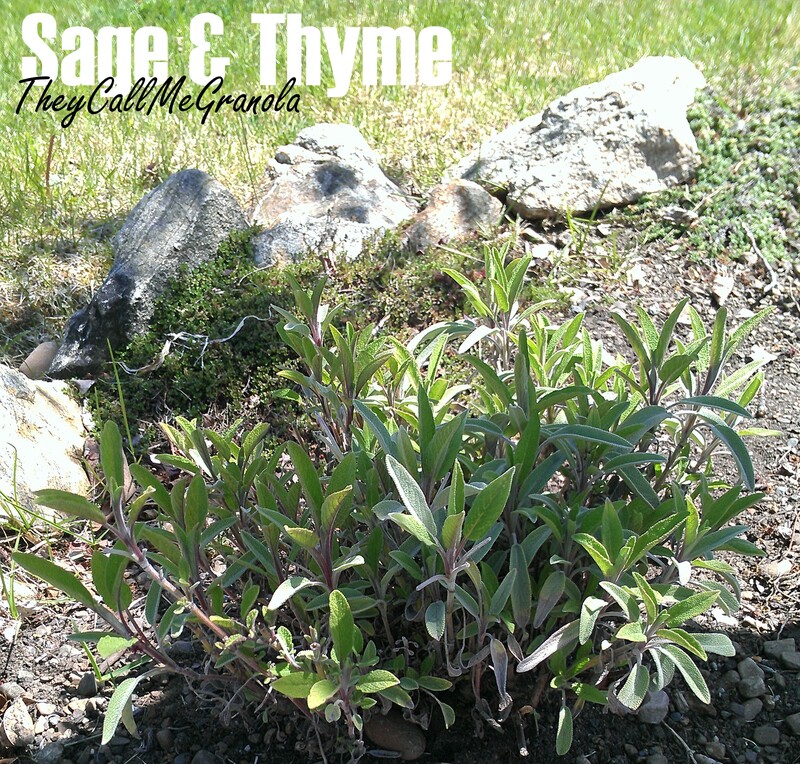 This plant has a few medicinal uses which I have not experimented with as of yet. Well, I think that’s all… aside from our friendly Dandelions (which I should totally start using! ), I don’t have anything else in my garden. Here’s hoping for a fruitful year! What are your best gardening tips?